Team India’s struggles in the last 18 months can be put down to that – lack of discipline. It is that distinct lack of discipline, whether in the bowling department or while batting, that has precipitated the rapid decline from being the top ranked Test side in the world. Although India seem to give a decent account of themselves in the limited overs game, despite playing with almost the same cast of players, this is more starkly revealed in the Test arena, which puts the ability of the players to stay disciplined under the most severe of investigations and pressure. When Virender Sehwag burst on to the international scene, he took it by storm with seemingly carefree stroke making that took the attack to the opposition. The Indian team management had to make space for him in the playing XI and made him in to converted opener, a role in which he has thrived and gone on to set records. Sehwag’s game plan runs counter to age-old philosophy of Test match batting, which is to minimize risks, especially at the top of the order. 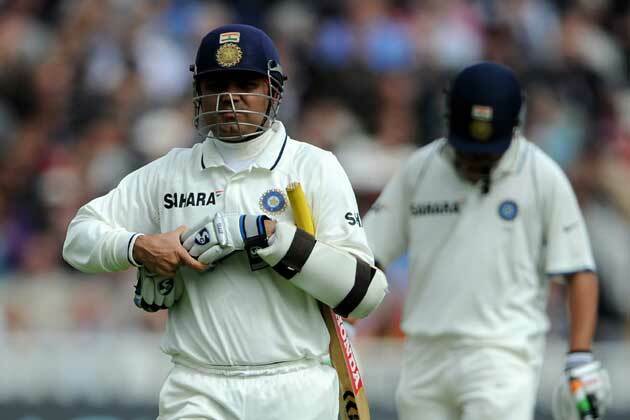 Whenever exasperated fans asked questions about some of his dismissals when Sehwag had not given himself the time to get in, the template answer was, “That’s the way Sehwag plays”. That is fine; in a line up where he is the exception rather than the rule, when he is backed up by the bloody-mindedness of Dravid, Tendulkar and Laxman, and to an extent, Ganguly. Not when he is surrounded by “natural stroke makers” like Yuvraj Singh, Virat Kohli, MS Dhoni and an out of form Gambhir and Tendulkar. So far in this Test series against England, the only ones that have shown the self-discipline to build an innings have been Cheteshwar Pujara and Sachin Tendulkar, and Ashwin (whose primary job is bowling). When Pujara provided the big runs in Ahmedabad, India looked very good, following the principles of Wadekar-Azharuddin tango from the early 90’s. R Ashwin, as a lead spinner, has been ruthlessly exposed. Even if his performances in Australia could be explained away with “unhelpful surfaces”, his abject returns against England have brought his spot in the team as one of the primary bowlers under serious consideration. He could, and probably will, get loads of wickets against inconsistent batting sides like New Zealand and West Indies, but his limitations are brought to the fore against competent batsmen who are not willing to gift-wrap their wickets. For someone that took 50 Test wickets in no time, to say Ashwin “lacks discipline” is an understatement. He lacks the ability to plow away at the batsmen with lines and lengths, bordering on boredom. The same could be said of the veteran of 45 Tests, Ishant Sharma. It probably was tough for the fans of India who heard MS Dhoni through the stump microphone, and lost track of the number of times he admonished Ashwin for bowling a long hop, to release any semblance of pressure the Indian bowlers may have brought on the English batsmen this series. Currently, in world cricket, there is one very good side, bordering on greatness if they sustain their excellence for another few years – South Africa. The rest of the teams have a fair bit of chinks in their armory and could be made to look like amateurs. We saw that when Pakistan spun webs around England, Sri Lanka lost to New Zealand at home, England hammered Australia, New Zealand were ground to dust in West Indies, and India being reduced to innocent bystanders in England, Australia and now at home. Two fundamental differences between India and the other teams is that they lack a penetrative bowling attack, which England, Australia, Pakistan, New Zealand and West Indies possess and a couple of batsmen who are disciplined no matter the situation, a la Cook-Trott or Hussey-Clarke, or in the Chanderpaul-Misbah mode. The inability to put big scores up and an undisciplined bowling attack incapable of bowling opposition out regularly is a recipe for disaster and that is exactly where India find themselves to be. This brings in to question the role of Coach Duncan Fletcher. His role with the team was unknown even after the 4-0 series loss to Australia, and it still remains that way. If the root cause of the problems of Team India can be traced to a lack of discipline, it is the coach’s job to instill it. If the coach isn’t doing his job, he needs to be let go. If the coach is doing his best to instill discipline but the players are not following through, then it is time to look for players who will. Players whose form has deserted them need to make way for players in the domestic set up who still have it. Gambhir, a man that not so long ago was thought to be next in line for post of captain, is struggling. The effectiveness of Zaheer Khan – the “super hero of Indian cricket,” once expected to lead the bowling attack–has dramatically come down. Yuvraj Singh, always a dodgy, emotional selection, hasn’t justified his enormous talent in the Test arena for a long time. The selectors need to decide whether they still want to keep Tendulkar around. With the selection committee expected to meet soon after the Third Test at Kolkata, there is an opportunity to make a clean break from the recent past and chart a new course. However knowing how India’s selectors have tended to act, I won’t be surprised if there isn’t any change to the playing XI and, if any, Yuvraj Singh being replaced by one of Manoj Tiwary, Rohit Sharma, Ajinkya Rahane and Murali Vijay. Amidst all this is the continuing role of Dhoni. Does he warrant a spot in the side, as its default captain, with none of the established players performing in a way that could warrant them being bestowed with the captaincy role? His wicket keeping skills have slipped, as has his batting. He seems limited in the execution of his duties as captain in Tests, but that could very well be attributed to the overall mediocre quality of the team. A captain is only as good as his team, sure, but if Fletcher deserves part of the blame for the mire that the Indian team finds itself in, so must Dhoni. There is a choice in front of the Indian cricket establishment. Either they choose to go with the same players and hope they get back in form, or decide to go the other way and replace the non-performers and those past their primes with promising youngsters under new leadership. But the game itself doesn’t change. Test cricket is a simple game, but bloody hard; anyone can play it but only true professionals become very good and succeed at it. The part of being professional has to do with a consistent approach to the game, and being willing to do the boring and the mundane again and again–you know, discipline. This entry was posted in Featured, India and tagged Ashwin, India, India v England, Ishant Sharma, Sachin Tendulkar, Sehwag, Test Cricket, Virat Kohli. Bookmark the permalink. I like your insights but don’t you think it’s just one-sided just because India is under-performing at home? Even Australia and other country’s have recently lost with a massive margin. If I was one of the selectors or good pal of Duncan Fletcher I’d have asked him to visit this article and bounce back with a better fight with India’s upcoming game. Besides Sachin I think India also need good option for a wicket kepper. No Parthiv, Karthik but maybe someone who’s relatively younger and with a hunger to perform. Dhoni as captain because…. TINA. About firing Fletcher, BCCI knows the position isn’t the most lucrative one, and which coach could help a team out of this slide with limited powers as coach? It is perhaps improper to weigh an article striving to retain important balance in rough times with one’s opinion. Also, for one to pick and choose agreements with the article is merely mothing more than an exercise in self-satisfaction. That said, all options have been placed on the table and hopefully the combination chosen by worthies produces better results in future. We need a spinner to do the job of containment at one end, while other bowlers attack at the other end. Someone like Venkataraghavan who would bottle an end up….For Nagpur, if it anything like the Wankhede pitch, we should select Jadeja for his quickish and flat left-arm spin. Not sure what value the racist joke at the start added to the article? I did have second thoughts about it. When I was pondering about the performance of the Indian team, that episode of South Park came to mind and hence, I started the post with it. I wrestled with myself whether I should phonetically write what the Karate master says, which can be construed as racist. I did a second reading of it, and the phonetic reproduction IS racist, and does not add any value to the post and so, I have edited and updated the post. Thank you taking the time to let me know. I sincerely appreciate it.